Because medical emergencies can occur suddenly and without warning, your medical supplies should be diverse and unique to your family’s needs.Therefore, having a wide array of medical supplies at your home can help diffuse an alarming situation. Last week, my 5-year old slammed her finger in the door so hard that we thought it was broken for sure. Immediately, her finger began swelling and my husband and I were about to bolt out to the door to take her for an X-ray. She was terrified and crying, and all we wanted was to take her pain away. I grabbed an instant ice pack out of our medical supplies for her finger and decided to wait 30 minutes to see if the swelling changed. I laid her on my bed and cuddled with her while ensuring her fingers were in between the ice pack. When I checked her finger, the swelling had begun to subside and I breathed a sigh of relief. You never know when a medical emergency will arise, but you are always hoping that when it does, you will be ready for it. As I previously mentioned, to be fully prepared for a medical disaster, you need to have a well-rounded medical supply. Since there are so many different types of medical supplies to store, I have broken them up to make the list more affordable. Click to see List 1 and List 2. Because medical emergencies can occur suddenly and without warning, your medical supplies should be diverse and unique to your family’s needs. Situations may arise and getting to the store or the emergency room may not be a viable option. Therefore, having a wide array of medical supplies at your home can help diffuse an alarming situation. When creating a medical supply, think about which medical issues will most likely occur and prepare accordingly for them. Also, have some supplies on hand for any family members who have pre-existing conditions would make a prolonged disaster more comfortable. In 2006, The National Hospital Ambulatory Medical Care Survey (NHAMCS) released a 2006 Emergency Department Summary that gathered statistics of emergency department use, including the most common reasons adults and children sought medical care and treatment. Having medical supplies that could assist in these common medical emergencies would be proactive on your part. It is very important to have vitamins in your medical supplies. Vitamins are essential in regulating body functions and also help in the healing process. Storing the right types of food that have the highest amounts of vitamins would be one way of ensuring that your diet is vitamin packed. Therefore, prepare by having first hand knowledge on what vitamins the body needs on a daily basis. Storing multivitamins such as, Centrum multivitamins or Centrum Silver multivitamins are great options. Ensure that your vitamins and medical supplies are stored appropriately and organized in a way that is easy to access. When an emergency arises, the person administering medical assistance will be appreciative that everything is in place and be ready for use. 1. 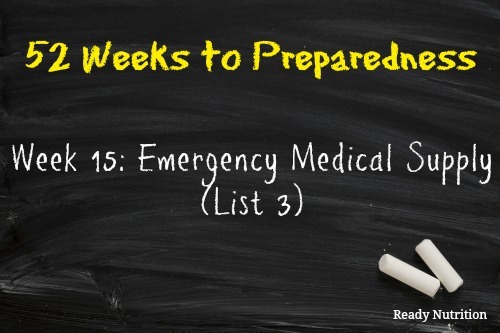 Create some first response medical packs to make emergency situations easier to care for. 2. Take another first aid course, or purchase a first-aid book. 3. Practice basic first-aid techniques regularly.